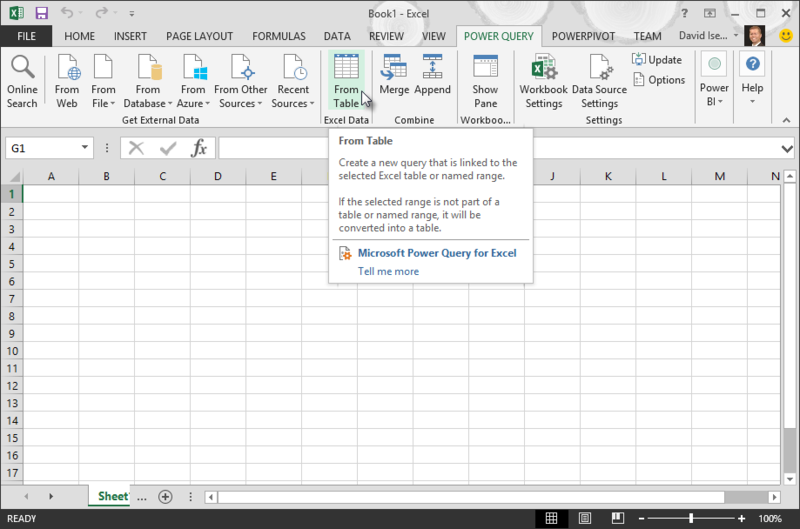 Use Excel's Get & Transform (Power Query) experience to create a dynamic connection to an existing table or range in your workbook. You can then refresh the connection when the data in table changes. Click the Data tab, then > From Table/Range. 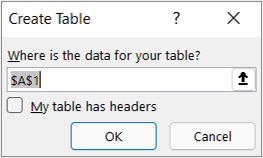 If prompted, in the From Table dialog box, you can click the Range Selection button to select a specific range to use as a data source. If the table or range of data has column headers, you can check My table has headers. The header cells are used to define the column names for the query. In the Query Editor, click Close & Load. Note: If your data range has been defined as a named range, or is in an Excel table, then Power Query will automatically sense the entire range and load it into the Query Editor for you. Plain data will automatically be converted to a table when it is loaded into the Query Editor. In the Power Query ribbon tab, click From Table. If the range of data has column headers, you can check My table has headers. The range header cells are used to set the column names for the query.